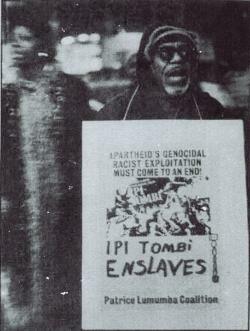 Picketer with poster made by the Patrice Lumumba Coalition at the opening night of the South African musical "Ipi-Tombi." Picketers demanded that Ipi-Tombe be closed. This photograph and a related article were published in Liberation News Service Packet 842, January 15, 1977; the packet is available on the Liberation News Service 1968 - 1981 Archive website.